I plucked this book off my shelves where it has been for years, in order to read something published in 1947 for my Century of Books project. Really, that was my criteria. And this time, such a random choice proved a good one, as I greatly enjoyed this read. Another wartime read, this one is much more grim and serious than the last novel set during wartime that I just finished. But this is also a novel that, unlike many others I've read, treats the war contemporaneously, and reflects mostly on the psychology of post-war life as experienced by the two younger main characters. During the action of the book, VE Day and the bomb in Hiroshima both occur, and both times, the reactions are not what we might expect from our current-day perspective. It was fascinating. This is the second novel in Johnson's "Helena" trilogy, although I didn't know that when I began. The books do stand alone, even with frequent references in this one to the past shared between Helena and her children: stepson Claud and daughter Charmian. Those who live their lives quietly, unmoved by either great sorrows or great joy, are often, in their final years, granted the dispensation of Discovery. Now, for the first time, they find out the secondary roads of the imagination, the side-streets, the alley-ways, the low doors each with a key in the lock. ...But those who have lived richly, exhaustively, staring into every face, attentive to every voice, are only too often pursued by the spinster Furies, and are driven at the end down avenues of stone where the walls reach to the sky, and the doors are sealed, and the pavements are rubbered against all sound but the beat of the hurrying heart. It's an intimate character study, of Claud, of secretive Charmian, and of course of Helena. Johnson skewers pretension and doesn't let any of the characters escape self-knowledge in the end. The London life they lead tires them all, and yet seems inescapable; Claud wonders if he will go on taking care of Helena in her emotional ups and downs forever -- eventually understanding that he must leave her in order to carry on his own life. Charmian struggles with her wartime marriage, which many people, including Claud and Helena, think was a terrible mistake. And Helena, at centre stage, focuses on herself most of all and on the strangely intimate and unwieldy relationship she's formed with a former army friend of Claud's, John Field (or as she styles him, Johnny). It's a foreign, uncomfortable read in some ways, but an illuminating one in many others. The characters' foibles are clearly drawn, the small aggressions of society are revealed, and the impulses behind actions that are clear to others are cloudy to those acting them out. It's very realistic in that way, and it creates such a visceral sense of the period. One of the characters even mentions that she's done over her dress in a "Make Do & Mend" class -- one of the first times I've seen that mentioned in fiction. It's all so of-the-moment. And the vast, overwhelming exhaustion, physical and emotional, resulting from the war and its eventual cessation clearly permeates the whole story. 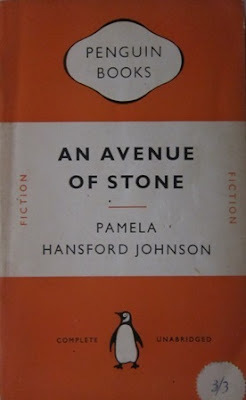 This is absolutely worth searching out, even if you haven't read the first book in this set - I haven't and yet really connected with this one. Recommended. Melwyk, this novel does sound very worthwhile. It seems like the characters in this novel are well rendered. Excellent review! It was! It's very nice to discover something new. Oh this sounds great, and as you say, right up my street. I think they have a picture of a Make Do and Mend class in the Imperial War Museum photo collection. I see a blogpost coming! Thanks for highlighting this one. There is a fabulous paragraph or two describing two dresses that the young lady has made over into a new one. I think you'll like it! I love to read novels that were written contemporaneously with events that I have read about in historical novels. This trilogy is definitely going on my TBR list. Thanks! I agree - it's so interesting to see how people thought before they knew all the endings of everything that we know now.